The National Museum of Australia’s international program shares great Australian stories with global audiences, brings the best of international collections to Australian audiences and develops strong partnerships with museums and galleries around the world. The Museum’s unique exhibitions from Indigenous Australia are sought after internationally, with recent displays in 47 countries including the United Kingdom, China, Japan, Mexico, Singapore, Turkey and Belgium. The National Museum’s Aboriginal and Torres Strait Islander exhibitions expose audiences to transformative experiences where deep truths are animated through exceptional contemporary art, offering a range of immersive and participatory experiences. These touring exhibitions have everything from bark painting to virtual reality; digital flat screens to the world’s only travelling state-of-the-art digital dome; epic installations woven with spinifex grasses to Emmy award-winning multimedia presentations and numinous canvases. 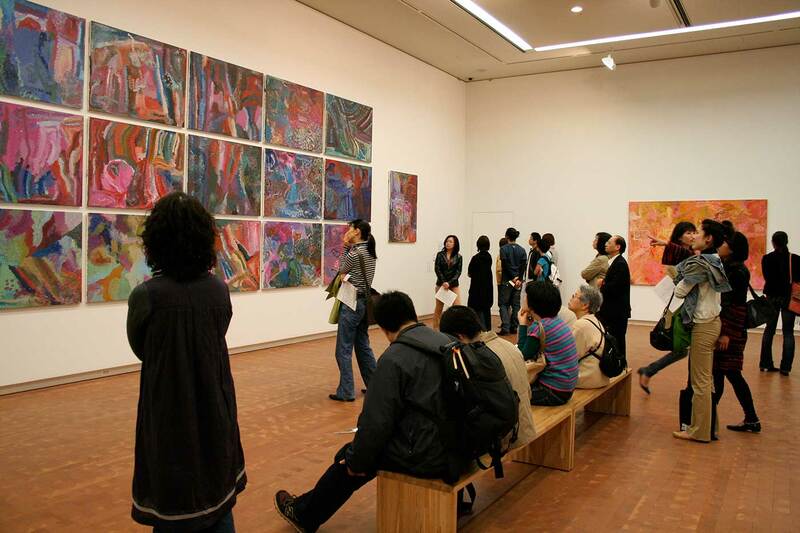 Despite being totally unknown in Japan, Kngwarreye’s work struck such a chord: it was deemed ‘the most successful contemporary art exhibition ever seen in Japan, breaking Andy Warhol’s record of ten years standing’. The National Museum is taking Australian stories to the world. The breadth and diversity of human experience of the Australian continent and its remarkable environments are shared in exhibitions and programs. The Museum has developed exhibition formats suitable for any venue, working flexibly and collaboratively with touring partners and host institutions to successfully meet the needs of individual venues and diverse audience markets. 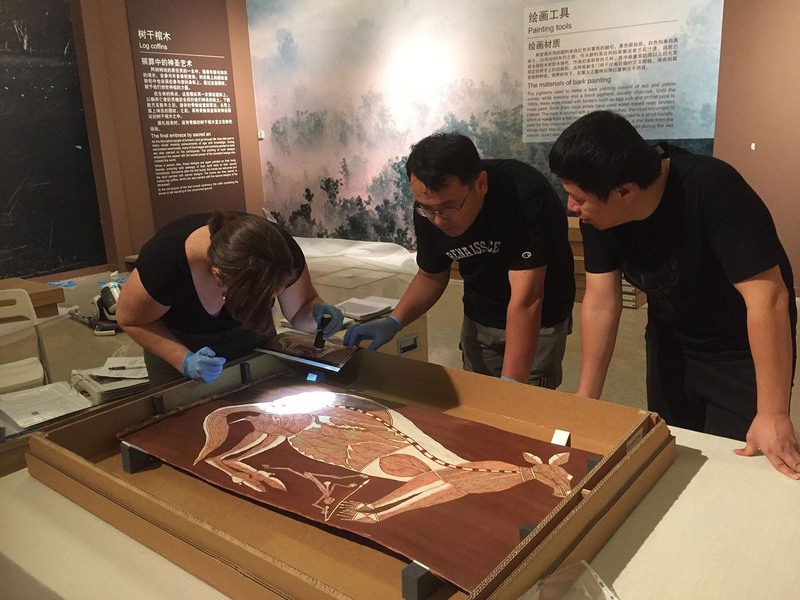 Staff exchange and building cross-cultural expertise and understanding have been crucial to strengthening the Museum’s partnerships overseas and producing award-winning international exhibitions. In 2016, the Museum won the coveted ICOM Australia Award for its innovative and multidisciplinary Encounters project developed in partnership with the British Museum. That same year, the Museum toured its One Road exhibition of paintings from the significant Canning Stock Route collection to four museums in Japan, extending its established relationship with colleagues who worked on Utopia in 2008. National Museum Director Dr Mathew Trinca was appointed as co-chair of the Australia–Singapore Arts Group (ASAG) in 2016. This group was formed to drive an ongoing program of cultural activities to enhance cultural relations, develop professional skills and cultivate audiences. Through meaningful and long-term relationships with international colleagues, the Museum continues to stimulate cultural exchange, develop a deeper dialogue between nations and increase engagement with audiences at home and abroad. Staff exchanges, cross-country expertise and understanding, joint research, reciprocal programs, and face-to-face interpretation of touring exhibitions foster international connections. The Museum's international program contributes to building a global community of museum professionals and allows the Museum to take an important role in the global conversation of First Nations peoples advocating internationally for the value of cultural collaborations. The National Museum’s investment in skills development and collaboration will contribute to building a global community of museum professionals. The Encounters Fellowships Program is part of the Museum’s Cultural Connections Program, which supports professional development and capacity building initiatives for Aboriginal and Torres Strait Islander cultural workers and creatives.